Spirit People - WHO IS KATIE HEPPER? Katie Hepper at work in her studio. Ever wonder where the original Spirit People logo came from? This timeless design is straight from the hand and brushwork of one of Hobart’s most influential young creatives, Katie Hepper of The Understorey. 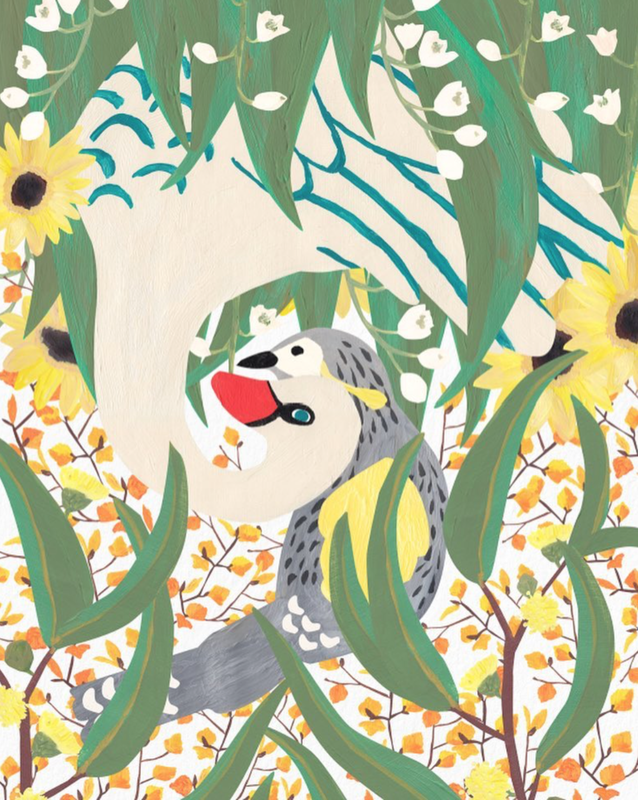 As a freelance graphic designer and illustrator, Katie is one of a growing number of Tasmanian creatives carving a career that is informed by the rugged beauty and ancient terrain of the Tasmanian wilderness. As an avid runner, Katie has a unique creative process that involves drawing inspiration from the landscapes she is immersed in while running. Her perceptive inclination tunes her in to the details around her rendering not uncommon moments wonderfully poignant. We sat down with Katie to talk about the poetic resonance in her work and its ability to take nature’s tiny, often overlooked, details and elevate them to works on paper that are unique, humble and beautifully inspired. You use a lot of images derived from nature in your work. How do you draw inspiration from your surroundings and why is nature important to you? Why do you think that resonates with your clients? I don’t use images as such but I think my design work has more of an ‘organic’ influence. Every project I encounter starts with pen on paper and may then evolve to the computer. Starting by hand helps me quickly map out many different layout ideas, allows experimental freedom with forms/shapes, and helps me avoid getting bogged down with too much fine detail in the early conceptual stages of my work. I feel this first stage is the important seed for the development of any new project. Computers, design programs and templates are accessible to so many people but no one has access to your imagination. 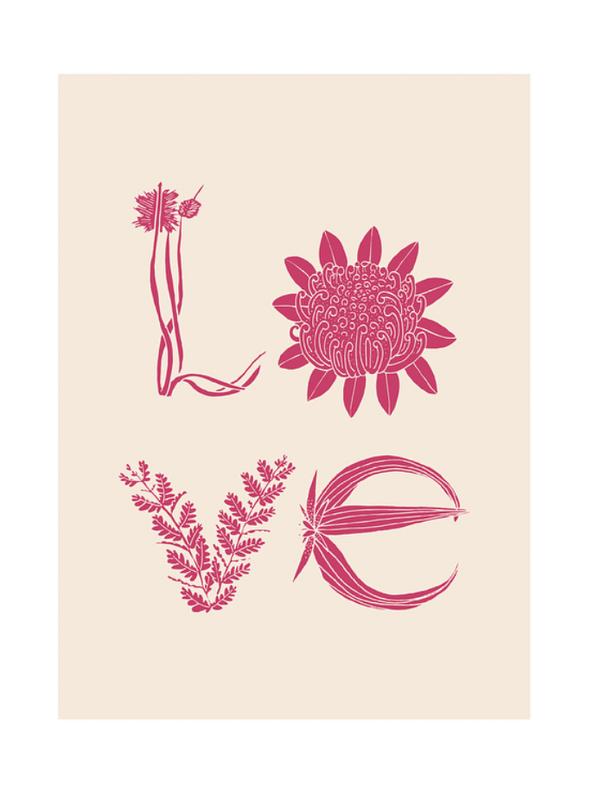 My illustration and typographic work is very much influenced by Tasmania’s wilderness. I spent my childhood camping, bushwalking and exploring with family and friends. Dad and I would spend many evenings after school kayaking on the River Derwent and our family home looked straight over the river and beautiful Kunanyi. Nature is definitely my source of inspiration. It’s always changing and evolving. I observe textures, colours, forms and patterns to inform my work. Clients see the journey and exploration in my work and feel connected. Do you take inspiration from other sources? Friends? Food & drink? Architecture? As a designer I am always educating myself and looking for inspiration from other creatives and great achievers. I am lucky to have such a wonderful bunch of mates around Australia who show incredible talent and creativity, whether it’s photography, videography, writing, architecture, music, landscape design, art or illustration. The support they have given me over the years has definitely pushed me to keep evolving my business and have the confidence to take risks along the way. Your idea of unwinding is taking a “little” 32km jog. How does that balance with your workflow? It’s probably not to unwind, but rather more to “reboot” the system. Some weeks can be tough when spent standing behind a computer screen, so getting outdoors and challenging myself physically is what I crave as a counter balance. Trail running in Tasmania takes me to places where I feel removed from the fast-paced world. Where I can experience the ‘now’ and the raw beauty of the wilderness. Running encourages me to reflect, refocus and let go of any useless/wasteful thoughts that I may be hanging onto. There have been times when, halfway along a trail, I’ve come up with some great creative ideas! Having a work/life balance is extremely important to me now. I’ve been in jobs before where I’ve felt run down, bullied and stripped of my creative soul. Thankfully this has only made me stronger and more determined to follow my heart. Its been quite incredible watching you move closer to your illustration work over the last few months. How have you found the drive to pursue the work you love? Has it been difficult to define the direction of your creative projects? I love creating projects for myself! I always have a few on the go. Lately my interest in drawing and painting has developed into pattern-making. Ideally I would love to focus more on textile design and incorporate my nature-inspired art work into that. I don’t have the money to dive in deep and pursue it just yet so it’s still a side project for now. I also want to do more children’s book illustrations. My partner loves to write poetry and last year we came up with a beautiful book idea about Tasmania’s wilderness. We’ve come up with a poetic story so now I just need to do the illustrations. It’s a slow process! I try to be as flexible as possible with my clients and sometimes we both need to make compromises along the way. The design process needs to be clear from day one so the client understands and respects the creative journey that is ahead. As long as I create a strong concept that communicates well to the client, the rest falls into place. How do you see your business growing in connection with other small businesses around you? I think that as creative people we need to encourage, support, collaborate and grow together, not just as individuals, but as a creative community. If we continue to push each other forward and strive for excellence, this will ultimately raise the overall quality standard of design in Tasmania. If you want to know more about Katie’s work, please contact her via The Understorey.